One day in March of last year in Sochi, Russia Canada was playing its 11th and final curling game. This game would decide if Canada would bring home a Gold or silver medal. Having won its 10 previous games without a loss, the Canadian team formed of John Gessner, Shawn Demianyk, Ross Lavallee, Kayle Miller and David Morton won the World Deaf Curling Championships. “It is a great feeling winning the Gold, especially when we had won 11 games in a row without losing a single game. We worked hard for this and it paid off,” said Gessner, the team’s skip. Upon its return from Sochi, the team didn’t sit on its laurels as they play curling on a weekly basis, and took part in five different bonspiels until now. The team also practice with a coach several times a year. The team formed of the same players, except for David Morton who is replaced by Joe Comte is ready for the national trials at the Canada Deaf Games this month. 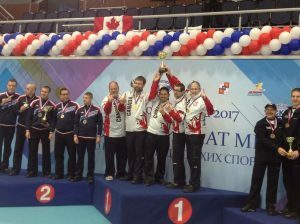 The winning men’s team at the Games will represent Canada at the 2019 Winter Deaflympics. “We are looking forward to the Games. We expect a higher competitive curling tournament than in Edmonton for the 2017 national trials,” said Gessner. 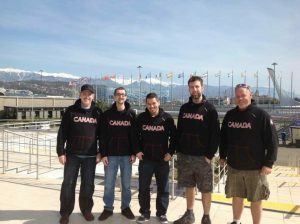 The five of them together culminate more than 20 years of experience in recreational and competitive curling. Canada has always done well in Deaf curling on the national and international stages, and the team plans to preserve that reputation at the Canada Deaf Games. The goal: a Gold medal at the 2019 Winter Deaflympics to improve the previous result of the 2015 Winter Deaflympics in Khanty-Mansiysk, Russia (silver medal). Gessner, Lavallee and Comte played in several editions of the Canadian Deaf Curling Championships as well as Deaf national trials, and they won several Gold and silver medals over the years. However, a generation of new players is welcome. “We hope to see more young players play curling. We know there are a few players at the Games that we have never played against. There are also some players that contacted us to let us know about their interest in playing. This is a good sign and we are happy about it,” said Gessner. Curling games at the Canada Deaf Games will be on Feb. 20, 21, 22, 23 and 24. Consult the men’s curling tournament schedule.